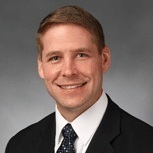 A Missouri lawmaker is proposing to do away with corporate income taxes. According to numbers quoted by Kraus, the state collects between $350 million and $400 million a year from corporate taxes. Corporate taxes since 2013 have accounted for between 3.2 percent and 5.14 percent of overall tax collections. Because corporate taxes make up a small piece of the state’s revenue base, Kraus contends they can easily be eliminated without sacrificing state revenues. Interestingly, a tax policy group opposed to Kraus’s proposal also acknowledges corporate taxes play a relatively inconsequential role in Missouri, although not from the standpoint of eliminating them. Of the surrounding eight states, only two have lower corporate levies. The rate in Oklahoma and Kentucky is 6 percent while it’s 6.25 percent in Missouri. The other six states tax corporations at a higher rate, topped by Iowa at 12 percent. Kraus’s proposal would gradually eliminate corporate income taxes over three years. The rate would move from the current 6.25 percent to 4 percent in 2017 and 2 percent in 2018, while there would be no tax after 2019. Lawmakers will decide whether to consider Kraus’s plan in the upcoming state legislature.